Pinnacle diving in Gorontalo is possible at several dive sites. Most pinnacles here are tall pillars of coral. One pinnacle is so large that it resembles an island that sunk below the surface of the sea. Here are three dive sites where pinnacle diving is primary. This dive site is named after an early supporter of diving in Gorontalo, Mbak Mira Hassan from Jakarta. It offers beautiful views of pinnacles rising along a steep slope of white sand and coral. Miguel’s Diving begins this pinnacle diving experience at a series of three large pinnacles. They descend in a row. Various other pinnacles and promontories make for a continually changing landscape. This dive site is protected from heavy waves. 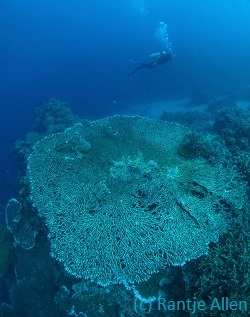 The result is table corals grow to over three meters in diameter. The dive typically ends over a tall pinnacle. This site is about 400 meters long. Conditions: Visibility varies depending on wave action. Sometimes the long shore current pulls the river water towards the dive site. So, visibility can range from ten to 30 meters. Special Note: The coral reef at this dive site rises to the surface. After finishing pinnacle diving here, divers are picked up in blue water. The boat cannot approach the reef. All those giant table corals are fragile. Please do not try to see how close you can hover over them! Descend to avoid the surface current amid swirls of anthias and chromis and their shallow coral garden. Your dive guide points out three pinnacles. Notice the Salvador Dali sponges on them. Ahead is a cluster of large Cigar sponges (Haliclona vanderlandi 2001). 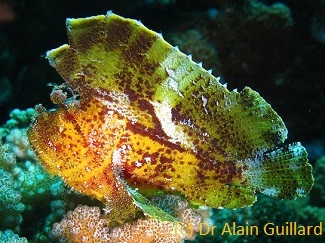 This is a new species found during wall and pinnacle diving in Sulawesi. In the crook of the arm of a long pinnacle, the dive guide has found a Soft coral crab. Nearby is a baby Salvador Dali sponge. It measures less than 20 cm tall Already it exhibits the distinctively carved surface of this unique sponge found only in Gorontalo. Your dive guide beckons for you to watch a Gold-spec jawfish (Opistognathus randalli, 2009). It is one of the newest species found in Gorontalo. Nearby a finger-sized Ring-eye jawfish disappears into its hole. It is still an undescribed species. Divers pass a pinnacle shaped like the long blade of a giant knife. Passing several more points, your dive guide points out a spiky Ruby-lined sea cucumber. His dive torch brings out its vibrant color. Leaving the large spirals of a greenish Turban coral, notice the first of several gigantic table corals. Nearby a small pinnacle swarms with glassy cardinalfishes. Among dense coral growth, your dive guide points out tiny, mostly transparent Pink-eyed gobies. Your pinnacle diving time approaches one hour. So, your dive guide signals you to swim away from the coral bank towards deep water. Suddenly, a tall pinnacle comes into view. Make your safety stop hovering amid Purple queen anthias at the top of this pinnacle. More than a dozen pinnacles of varying heights rise from the slope. Because they are scattered at various depths, visiting all of them is not possible during a single dive. Some pinnacles are stubby, others tall and needle-like. One looks like a Rastafarian because of a tangled Octopus sponge growing on its top. Several host large anemones along with their associated fishes and shrimps. Pinnacle diving here includes diving over coral reef slope. This is one of the few dive sites in Gorontalo where divers have a bottom to observe. The slope is very gentle. The reef crest starts at two to five meters and descends to about 15 meters. The mix of coral, sponges and sand make this a relaxing shallow dive. The site is about 300 meters long. Conditions: Because of the sandy bottom, visibility varies greatly depending on wave action. Visibility can be anywhere from ten to 30 meters. Divers may miss major pinnacles without a dive guide familiar with the site. 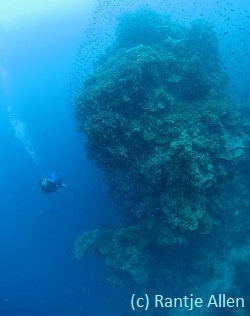 This pinnacle diving site is more mysterious in moderate visibility. Pinnacle after pinnacle emerges then disappears from view. They look like sentinels stationed along a misty hillside. This makes you wonder: against what danger lurking in the deep are they guarding? Descending in deep blue water, you encounter the first massive pinnacle rising from the depths. After a swim around this sentinel of the deep, move to the next seven pillars. One pinnacle has a huge bushy black coral on top. Be on the look out for lionfish prowling the pinnacle for careless fusiliers. Between pinnacles, scan the steep slope for the beautiful Gilded triggerfish (Xanthichthys auromarginatus). Usually found only at depth, here both males and females ascend to quite shallow waters. After the Rastafarian sentinel, the upper slope becomes very gentle. The bottom here is more open and sandy. Numerous large colonies of branching Acropora grow. Notice the striking Bicolor angelfish (Centropyge bicolor). It is not found in dense coral environments. After passing a profusion of human-size guards and a deep double point, notice a large pinnacle rising from a steep sand and coral bowl. This sentinel is probably too deep for your current dive plan. The final three pinnacles are clustered in the twelve-meter depth range behind a coral arm that projects this trio. 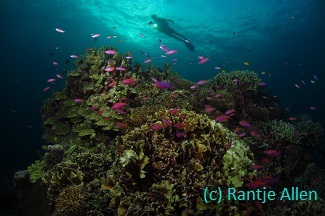 The mixed coral garden here officially ranks in the top five most biodiverse reefs in Indonesia. One of the cutest sand gobies here is the almost transparent, green-eyed Signalfin goby (Coryphopterus signipinnis). It sits on the sand and flicks its dark spotted first dorsal fin up and down. Although common at this dive site, it is missing in most fish identification books. Discovered by accident, this pinnacle is so large that Miguel’s Diving staff named it Sunken Island. It rises from a sandy bottom. Its edge closest to shore is as shallow as 15 meters. The side facing the open ocean probably plunges below 40 meters. Its large flat top is at seven meters. This top makes a perfect place to hover during safety stop time. Pinnacle diving here is best above 16 meters. The deeper walls are mostly rocky and uninteresting. However, at our recommended depth, this dive site looks like no other in Gorontalo. 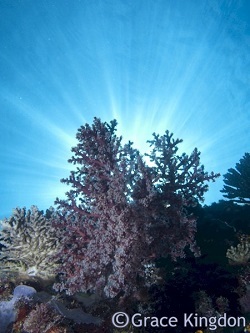 It is mostly covered with extremely dense, fine branching corals in multiple colors. There are patches of large Turban coral and gigantic pink Cabbage coral approaching three meters in diameter. The island is not uniformly round. One arm, in particular, wanders ocean ward. Divers rarely have any bottom time left to explore it. The top of this pinnacle is covered by submassive corals and hundreds of mushroom corals. Purple vase sponges rise profusely above about ten meters depth. The site also has a few patches of rubble. Miguel’s Diving typically guides this dive in a spiral, allowing guests to see most of the sea mount. Miguel’s Diving has never measured this site. Conditions: Sandy bottom and water movement affect visibility. It is rarely above 15 meters. Currents help attract schools of fish. In order to see these and other large marine life, divers need to follow the guide into the current. Large tidal change can create sudden and severe down currents. This site should not be dived at certain times during the month. Miguel’s Diving staff all live on the water and are quite familiar with Gorontalo’s changing ocean conditions. Follow your dive guide along a sand and rubble bank. At his signal, cross over the channel leading to the dive site. Look for impact craters of rubble. Actually, these holes dotting the sea floor are made by Yellow-margin triggers. They have used their fins to dig for crabs, shrimps and other edibles. One hovers mid water, keeping his distance. Surrounded by a field of large branching Acropora, a large coral rock is home to a pair of rare Black anemonefish (Amphiprion melanopus). They are living in a bulb anemone. Follow your dive guide along the sand bottom edging the coral mound. Your dive guide points out a Gold-spec jawfish (Opistognathus randalli, 2009). It is one of the new species found in Gorontalo. Rise to a plateau on the sea mount at about 15 meters depth. Please swim using side kicks, so as not to touch the fine branching Acropora. These dense colonies extend to the edge of visibility like an impenetrable forest. A large snapper swims away. Then a large Spanish mackerel passes overhead, inspecting the visitors. Swim into the current with your dive guide. He frantically points to a large dark rock ahead. But as you approach, the rock flicks its tail and disappears below the edge of the wall. It is one of several large Tiger groupers on the sea mount. Schools of grey chromis feed in the current. Pairs of Horned bannerfish hover over barrel sponges. A school of large Slender unicornfish pass as do schools of fusiliers. Hiding among the curves of a yellowish Turban coral, Flower cardinalfish observe the divers passing by. Your dive guide points as a Hawksbill turtle sails away. He points to a garden of giant pink cabbage corals. Swimming back into the current, your dive guide points to a large barracuda. It is getting its long teeth inspected by a cleaner wrasse. Nearby a Blue ribbon eel bobs up and down. It hopes to catch a small fish distracted by the presence of divers.